Here's a pretty good definition of my family: my brother Alex, my sister Emily, my cousin Jessica, my boyfriend Greg, and I were all on a little boat speeding out towards a coral reef. It had been windy for a few days and all snorkeling had been canceled for a few days, so our co-passengers were all excited to get in the water and see some fish. 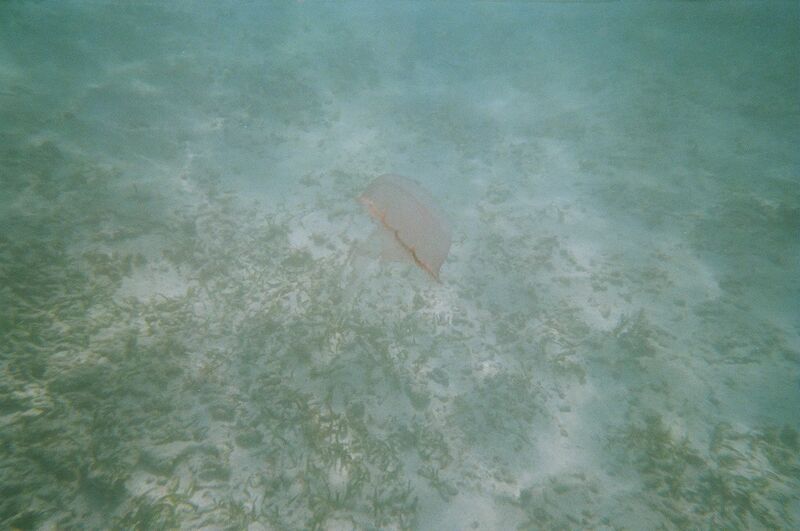 Then a man got on the intercom and delivered a warning: there were huge jellyfish all through the water. Was everyone cool with that? We were. No big deal. 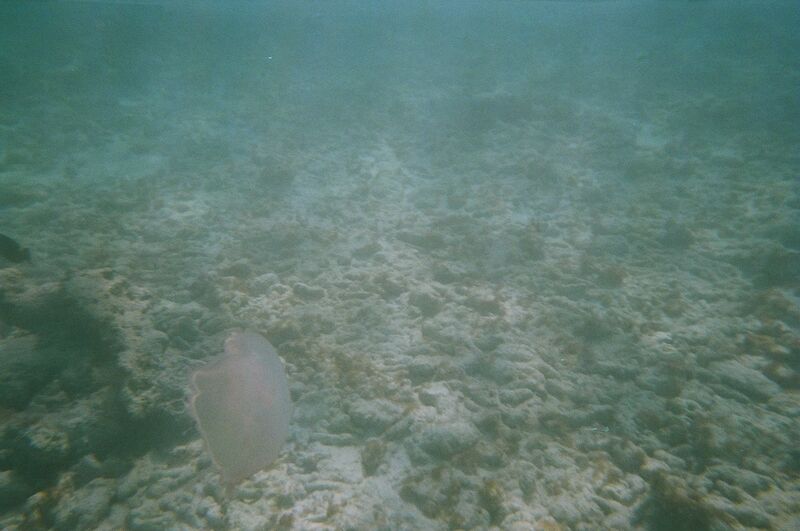 Within three seconds of jumping in the water, dinky underwater disposable camera in hand, I put my face in the water and saw a large pink mass right in front of me. "Jellyfish right there!" I yelled over to Greg, who had just plopped in himself. It's tough to scream with a snorkel in your mouth but I think he may have done it. Alex, Emily, and Jessica were splashing around up ahead and had already seen a barracuda. We wanted to catch up and get to the coral, so we started swimming. Here's the thing about huge jellyfish. It's the tentacles that sting, so those big, imposing heads are harmless. These particular ones were large-headed with small tentacles, therefore avoidable. But there's just something terrifying about a huge dangerous animal drifting into your field of vision. These were between about six and twelve inches in diameter, and every time I saw one, I gasped underwater. It quickly became apparent that the best way to avoid jellyfish was to, against instinct, keep your face in the water and look for them. 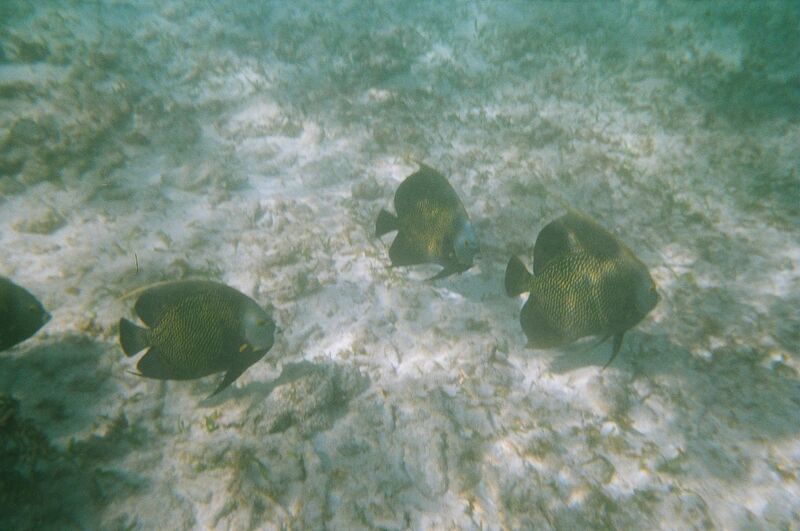 Sure, we were also looking for beautiful fish, and we saw many. But in order to enjoy the really unusual and beautiful things in the ocean-- and maybe everywhere-- you have to go to a place that's perhaps a little more dangerous than you'd like, and be as vigilant as you can. 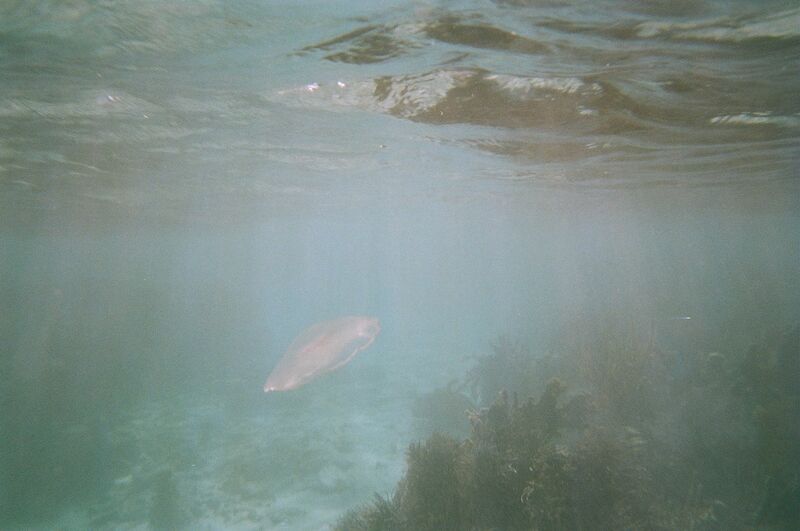 After a while-- after barracudas, and lots of fish whose taxonomic names I don't know-- I began to love the jellyfish. I was still shot through with fear every time I saw one, a sting perhaps greater than if I'd actually been stung by one, but it was impossible to ignore how beautiful they are. They're like UFOs moving through the water. Unlike fish, they have absolutely no urgency to their movement, and yet you know they're alive. It's like a brain floating in the water. Weird. Electric. Ominous. 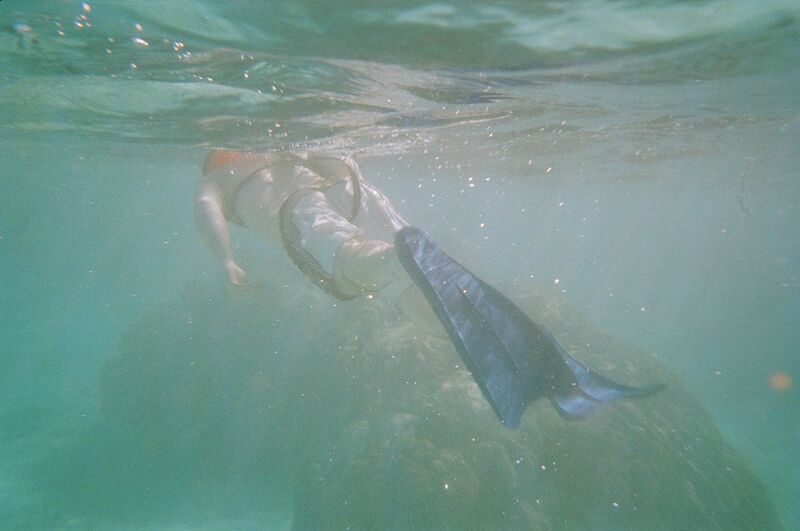 One of my favorite things about snorkeling and scuba diving is that it shuts up my usual chattering. In the water you can't talk. You point, or you use minimal hand signals. In the water, we pointed at jellyfish to signify "danger ahead." We pointed at coral to signify "wondrous thing ahead." Later, when we got out of the water, Greg told us that he'd seen from a distance that either Jessica or Emily had accidentally kicked a jellyfish. The force of the kick set the creature in motion, and perhaps some of its tentacles had broken off and dispersed, still harmful, into the water. When we surfaced we had small welts on our arms, and we laughed about how Emily could get fired from her job at Greenpeace for possibly kicking a jellyfish in Florida. We all felt a bit bad, I think. Something that weird should be left alone. It is a good thing, once in a while, to go to a place where you can't constantly spout off your opinion. It is a good thing to just point at things and say "this thing is amazing," even if it is dangerous, even if it's wild, even if it's something whose life you can barely comprehend.